Spreadsheets are the go-to information hub for individuals, teams, and organizations of all sizes to store data. However, large data sets can make it difficult to identify trends, pick out key pieces of information, and track deadlines. Luckily, Microsoft Excel has a feature called conditional formatting that alleviates some of these challenges. Conditional formatting enables you to apply special formatting to cells in your spreadsheet that meet certain criteria. Excel has a sizable library of preset conditions that you can apply fairly simply, or you can create your own conditional formatting rules using Excel formulas. This guide will provide in-depth step-by-step examples of the most popular conditional formatting functions for basic and advanced users in Excel 2016. Then, we’ll show you how to perform the same functions in another spreadsheet application, Smartsheet. Conditional formatting is a feature in many spreadsheet applications that allows you to apply specific formatting to cells that meet certain criteria. It is most often used as color-based formatting to highlight, emphasize, or differentiate among data and information stored in a spreadsheet. Conditional formatting enables spreadsheet users to do a number of things. First and foremost, it calls attention to important data points such as deadlines, at-risk tasks, or budget items. It can also make large data sets more digestible by breaking up the wall of numbers with a visual organizational component. Finally, conditional formatting can transform your spreadsheet (that previously only stored data) into a dependable “alert” system that highlights key information and keeps you on top of your workload. Originally a powerful feature of Excel, other spreadsheet applications have also adopted this functionality. If-Then Logic: All conditional formatting rules are based on simple if-then logic: if X criteria is true, then Y formatting will be applied (this is often written as p → q, or if p is true, then apply q). You won’t have to hard-code any logic, though - Excel and other spreadsheet apps have built-in parameters so you can simply select the conditions you want the rules to meet. Advanced users can also apply the program’s built-in formulas to logic rules. Preset Conditions: Excel has a huge library of preset rules encompassing nearly all functions that beginner users will want to apply. We’ll familiarize you with several of the most popular ones in the next section. Custom Conditions: For situations where you want to manipulate a preset condition, you can create your own rules. If appropriate, you can use Excel formulas in the rules you write. Applying Multiple Conditions: You can apply multiple rules to a single cell or range of cells. However, be aware of rule hierarchy and precedence - we’ll show you how to manage stacked rules in the walkthrough. Overall, applying conditional formatting is an easy way to keep you and your team members up to date with your data - calling visual attention to important dates and deadlines, tasks and assignments, budget constraints, and anything else you might want to highlight. When applied correctly, conditional formatting will make you more productive by reducing time spent manually combing data and making it easier to identify trends, so you can focus on the big decisions. You’re now ready to apply conditional formatting to an existing data set. This step-by-step walkthrough will show you how to apply the most commonly used preset rules in Excel 2016. Tip: You can only apply conditional formatting in the desktop version of Excel. Excel for Office 365, the cloud-based web application, allows you to view conditional formatting, but not edit or apply new rules. Highlight rules apply color formatting to cells that meet specific criteria that you define. They are the most basic type of conditional formatting rule, and Excel provides a variety of preset highlight functions. Open an existing spreadsheet in Excel, or start from scratch and manually enter new data. In this example, we’re using an inventory list that tracks the number of each item currently in stock, as well as some additional information about each product. To apply highlight rules, select the range of values you want to apply a rule to. For this example, we want to highlight any product that’s quantity is less than 100 units. So, select the values in the Qty. column (C4:C26). From the Home tab, click Conditional Formatting on the right side of the toolbar, and click Highlight Cells Rules from the dropdown menu. Click Less than. A box will appear. Type 100 in the empty field. Click OK. Your spreadsheet will now reflect this highlight rule, with the quantities less than 100 highlighted red with red text. Tip: You can change the color of the highlighted cell by clicking on the Format with: dropdown menu and selecting on another option. To highlight text cells, repeat step 2. This time, we want to highlight certain model types (M compatible), so we’ll select the cells in the Item name column. ​Type M compatible in the text box. To differentiate from our previous highlight rule, select green fill with dark green text from the Format with: dropdown menu. Click OK.
Now, cells containing the text M compatible are highlighted. Using these same steps and menu options, you can apply highlight rules to find Duplicate Values, Dates, or values that are Greater than…, Equal to…, or Between… values that you select. All of these possibilities are available through the menu options. Top/Bottom rules are another useful preset in Excel. These rules allow you to call attention to the top or bottom range of cells, which you can specify by number, percentage, or average. In this example, we’ll highlight the bottom five total stock values. Click the top of the Total value of stock column to select these cells. In the box that appears, change 10 to 5, since we only want the bottom five values. Since we already have a red fill highlight rule, click the dropdown menu and select yellow fill with dark yellow text. Click OK. Your sheet will now highlight the bottom five values in the Total value of stock column, and update as you add to your data set. Data bars apply a visual bar within each cell. The length of the bar relates the value of the cell to other cell values in the selected range. We’ll apply data bars to the Qty. column so we can easily assess the ratios of items in stock. Click the top of the Qty. column to select this range of cells. Click Conditional Formatting > Data Bars. You’ll see two options - one for Gradient Fill and one for Solid Fill. They function identically; just select the option and color you prefer. Your sheet will now reflect the added rule. Color scales are similar to data bars in that they relate a cell’s values in a selected range. However, instead of representing this relationship by the length of a bar, color scales do so with color gradients. One color is assigned the “lowest” value and another the “highest,” with a range of colors in between. We’ll apply color scales to our Selling price column. Click the top of column D to select this range. Click Conditional Formatting > Color Scales. You’ll see a variety of different color ranges; select the one you want. Your spreadsheet now shows the selling prices by color - red cells are the most expensive, and green cells are the least expensive. Icon sets apply colorful icons to data. They are simply another way to call attention to important data, and relate cells to one another. We’ll apply icon sets to the Purchase price column to show low, middle, and high priced items. Click the top of the Purchase price column to select the range of values. Click Conditional Formatting > Icon Sets. You’ll see a variety of options for Directional, Shapes, Indicators, and Ratings icons. You can choose any of these to fit the needs of your data. In this example, we’ll choose the first Directional option: red, yellow, and green arrows that indicate high, middle, or low priced items. Your sheet reflects this new formatting rule. Now you’ve learned the most common conditional formatting presets in Excel, your spreadsheet provides a lot of information at a glance. However, you might want to edit some of these rules later on, or delete them completely. Click Conditional Formatting and select Manage Rules… from the dropdown list. The Manage Rules box will appear. Click the dropdown menu at the top of the box and click This Sheet to list the conditional formatting rules you have applied to the current sheet. To edit a rule, click the rule you want to change. In this example, we want to highlight the bottom ten values in the Total value of stock column, rather than the bottom five that we currently have highlighted. Click the Bottom 5 row. Then, click Edit Rule… at the bottom of the box. A new box opens where you can adjust the conditions of the rule. Type 10 in the number field and click OK.
Excel will bring you back to the Manage Rules box. You must click OK to save the changes you made to the original rule. To delete a rule, return to the Manage Rules box and choose This Sheet. Click the rule you want to delete - in this case, the color grading on Selling price. Click the - symbol (next to Edit Rule…) in the lower left hand corner. Click OK. The conditional formatting on the Selling price column is now deleted. You now have everything need to create basic conditional formatting using presets in Excel 2016. For more advanced functionality such as creating a new rule, using Excel formulas, and creating rules dependent on another cell, see the “Advanced” section below. First, we’ll look at how we can apply the same conditional formatting rules we learned in Excel to another spreadsheet program, Smartsheet. 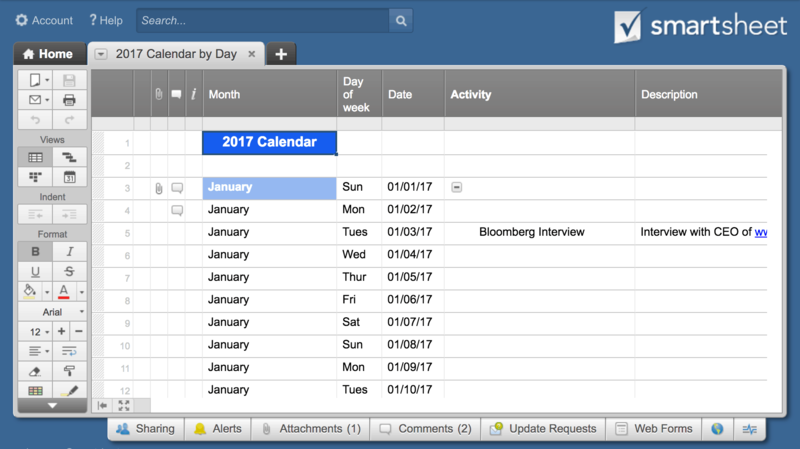 Smartsheet is a spreadsheet-inspired work management tool that also provides conditional formatting. As a cloud-based application, you can apply, edit, and remove rules in real-time, from any device. This how-to section will show you how to do every function described in the previous Excel section, with some modifications that better align with Smartsheet features. You can create spreadsheets in Smartsheet two ways: by manually entering data into Smartsheet, or by importing an existing spreadsheet from programs like Excel and MS Project. For this tutorial, we’ll use the same data set from the Excel tutorial, so we’ll import the original version (with no conditional formatting) from Excel. Name your spreadsheet. We’ll call this one Inventory List. Click Import. Your spreadsheet will open, using the same column and row formatting that was applied in Excel. All conditional formatting is controlled through the conditional formatting icon in the toolbar on the left side of the app. To highlight a cell, click the conditional formatting icon on the toolbar. A box will appear where you can set conditional formatting rules. Click Add New Rule in the top left corner. The if-then logic is already written into the new rule, so you can simply create the conditions. Click set condition. 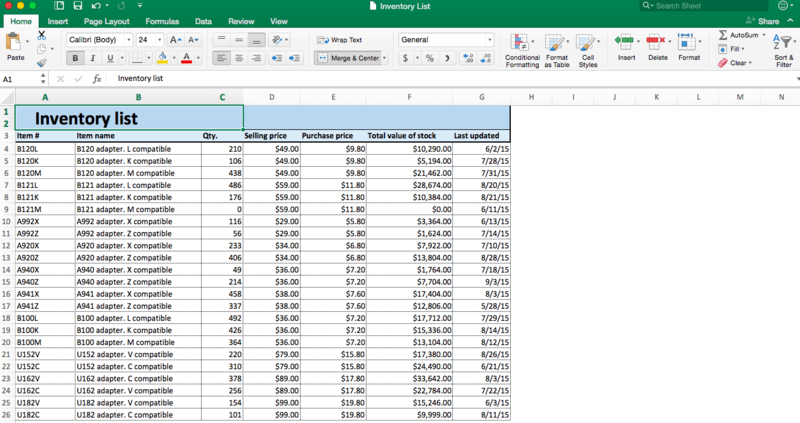 Just like in the Excel example, we want to highlight any items that are stocked below 100 units. Select Qty. from the column list on the left, select is less than from the center dropdown list, and then type 100 in the field on the right. Click OK.
Now we need to apply the formatting. Click this format and a dropdown menu with formatting options appears. For this example, we’ll use a paint fill. Click the paint bucket icon and select red. Specify which cells should get this this formatting. Smartsheet will default to format the entire row, but we only want to highlight the cells in the Qty. column. Click entire row and click Qty. from the dropdown list. Click OK. Your conditional formatting rule is now reflected in your spreadsheet. To highlight text cells, repeat steps 1 and 2. Click set condition. Now, we want to highlight any M compatible items. Select Item name from the left-most list, contains from the center list, and type M compatible in the right field. Click OK.
Click this format and click the paint bucket item. Select green. For this rule, we want to highlight the entire row. (Again, Smartsheet defaults to this option.) Click OK. Your second rule is now reflected in your data set. To highlight missing values, repeat steps 1 and 2. Click set condition. In this example, we want to highlight Total value of stock cells that are blank, so we can quickly identify missing values. Select Total value of stock from the left-most list and is blank from the center list. Click OK.
Click this format and click the paint bucket icon. Select black. Click entire row and click Total value of stock instead. Click OK. Your data set now contains three separate conditional formatting highlight rules. In place of Excel’s Data Bars preset, you can create Progress Bars in Smartsheet. Progress Bars are a symbol that you can apply to cells to show and compare the level of completeness. In this example, we’ll apply progress bars to denote current inventory levels (from zero to 100 percent). To create Progress Bars in Smartsheet, you first need to create a new Symbols column. Cells in a Symbols column will only hold special characters, such as progress bars. To create a new column, right-click the Qty. column and click Insert Column Right. A box will open. We’ll name this column Inventory Level, and select Symbols... from the list of column-types. In the right-hand field, scroll down and select the progress bar icon. Click OK.
Click into cells in the new Inventory Level column and select the appropriate level of inventory: Empty, Quarter, Half, Three Quarter, or Full. This progress bar relates the current level (from the Qty. column) to level you need. Here’s what your sheet will look like when all progress bars are filled in. Tip: You can also type Empty, Quarter, Half, Three Quarter, or Full into each cell, and Smartsheet will autofill with the appropriate progress bar. Tip: You can also automate progress bars by using an if-then formula in Smartsheet. For more information on how to do this, check out this resource on symbol formulas. Smartsheet doesn’t have a preset Color Scales option, but it’s easy to create the same effect using the highlight rules explained in Step 2 (above). As with the Excel example, we want to create a color gradient to differentiate among selling prices. To do this, create highlight rules and apply different colors to the top, middle, and low range of values. Remember to click the Selling price cell so you don’t highlight the entire row. 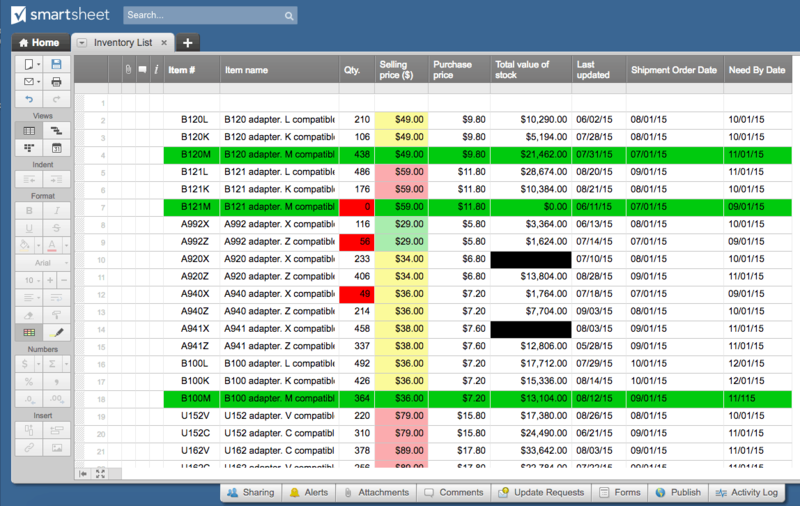 After you create the separate highlight conditions, the color scales will be applied in your sheet to the Selling price column. To apply icon sets in Smartsheet with conditional formatting, you’ll have to use formulas (we’ll get into that in the “Advanced” section). Instead, you can add informative icons to your data by creating a special Symbols column. Right-click the Qty. column and click Insert Column Right. In the box that opens, type Qty. Status in the name field. Click Symbols from the dropdown menu and choose from the library of available symbols (Flag, Priority, Decision, Status, Direction, and Measure icons). In this example, we’ll choose RYG balls in the Status section. Click OK. 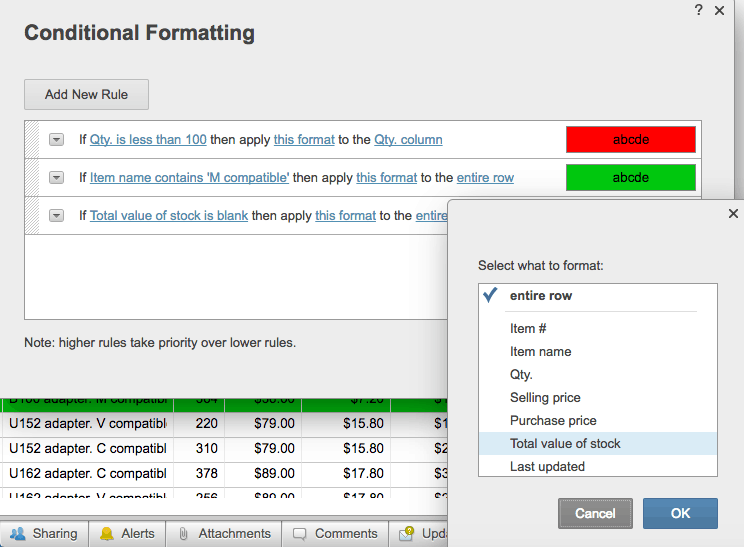 Editing and deleting conditional formatting rules in Smartsheet is extremely easy. To edit a rule, click the Conditional Formatting icon on the toolbar to open the list of rules. Click the condition you wish to change and edit the information in the box that opens. Click OK.
To delete a rule, click the carrot on the left side of each rule. Click Delete Rule from the dropdown menu. Click OK. Tip: You can also disable a rule by clicking Disable Rule from the dropdown menu and then clicking OK. This will put the rule on “hold” without deleting it, in case you want to re-enable it later on. In this example, we chose to delete the color gradient rule on the Selling price column. You can see this change in the image below. Now you know how to use conditional formatting and other colors and symbols to add formatting to your sheet in Smartsheet. In the following sections, we’ll walk you through more advanced conditional formatting functions in Excel and Smartsheet. For more advanced Excel users, familiarize yourself with the following conditional formatting functions to add even more customization to your spreadsheet. We will use the same data set in this section that we used in the previous Excel tutorial. In some instances, you might want to stop a certain condition, without deleting the entire rule. The Stop if true rule in Excel enables you to do so. In our example, we applied an icon set of three directional arrows to the Purchase price column to indicate low, medium, and high price ranges. However, we might actually only want to call attention to the lowest cost items, as three icons can clutter the sheet (and provide more information than actually needed). First, create a separate condition on this column. Click the Purchase price column to select these values. Click Conditional Formatting > Manage Rules… to open the Manage Rules box. Keep the default Show formatting rules for: Current Selection from the dropdown menu, because we are only adjusting the rule on this column. Click the + in the bottom left corner to create a new rule. A new box opens where you can assign conditions to the new rule. From the Style menu, select Classic. Instead of applying a different icon to bottom, middle, and top price ranges (as we currently have), we only want to show the bottom 50 percent. So, select Top from the left dropdown menu, type 50 in the middle field, and check the Percent box. To apply color formatting, Select Custom format from the Format with dropdown menu, and a new formatting box opens. Click the Fill tab, and click No Color. Next, click the Font tab, and select black text. Click OK.
Click OK again in the original New Formatting Rule box. You’ll return to the Manage Rules box, where you now have two rules applied to the Purchase price column. Click the Stop if true box to the right of the new rule you just created. Click OK. Your sheet will now only show the icon sets for the items with a purchase price in the bottom 50 percent. Adding Excel’s formulas to your conditional formatting rules is one way to elevate your logical rules. The AND formula is one of the most popular, easy-to-use formulas. It lets you add multiple conditions within a single rule, rather than writing out each rule separately. To format cells they must meet both conditions. We’ll create a new rule to highlight any cell in the Item # column that contains both a B and an L. Click the top of the Item # column to select this range of cells. Click Conditional Formatting > New Rule. In the dialogue box, select Classic from the top dropdown list. Select Use a formula to determine which cells to format, since we’re using a formula. We want to search cells in the Item # column for a B and L, and highlight that cell when both conditions are true. To do this, we’ll use Excel’s ISNUMBER and SEARCH formulas, with the AND formula, to look for the B and L values. Click OK. Your sheet will highlight all cells in Item # that meet both of these conditions. We use AND at the beginning of the formula to show that both of the following conditions must be met in order to apply the conditional formatting. The basic syntax of the nested formula is ISNUMBER(SEARCH(“substring”,text)) where “substring” is the character(s) you are looking for, and “text” is the cell(s) you want to search. We are searching for two separate conditions, so we write the ISNUMBER(SEARCH(“substring”,text)) formula twice, separated by a comma. This example is just one of hundreds of different formulas you could enter with the AND function. For more information on using Excel formulas with conditional formatting, click here. You can also create rules to highlight certain cells based on the value of another cell. In this example, we’ll create a “quantity threshold” - items with inventory level below this threshold will be considered “at risk.” We already have a rule that highlights cells in the Qty. column under 100. However, that threshold might change over time, depending on manufacturing or selling rates. So, we want to create a highlight rule that is dependent upon a threshold that we set. Create a new rule by clicking Conditional Formatting > New Rule. In the dialogue box, click Classic and Use a formula to determine which cells to format from the dropdown menus. In the formula field, type =C4<$I$5 and keep the default formatting. Click OK. Numbers in the Qty. column that are less than the Quantity Threshold in I5 (200) will now be highlighted. Now, you’ve created a dynamic rule. This means that as your threshold changes, the rule will still be applied to the Qty. column and the formatting will adjust as appropriate. In this formula, we are simply testing whether or not values in column C are less than the value in I5. Start with “=C4” to tell Excel where we want to start evaluating values from. Use ‘$’ symbol around I because it’s an absolute value - we are only evaluating cells in column C against this single cell. While data validation is not technically monitored through conditional formatting rules, you can use it to a similar effect: controlling the formatting of your sheet. You can apply data validation to ensure that any cell-type only allows certain entries (text or numbers only, text length, etc.). In this example, we’ll show you how to create a dropdown list and validate data only from that dropdown list. We’ll create an additional column of which employee last updated the sheet, and create a dropdown list to choose from. First, click where you want to add the column on the sheet. 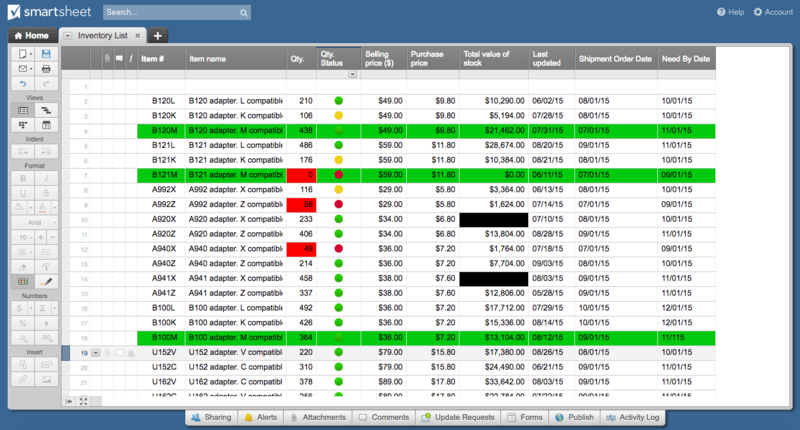 Create a new column by clicking Insert > Insert Sheet Columns from the ribbon on the Home tab. We’ll name this column Updated By. Now we need to make a list of employees, that the dropdown list will later pull from. Create a second sheet (in the same Excel workbook) by clicking the + sign on the tab at the bottom of the spreadsheet, and write a list of employee names in column B. 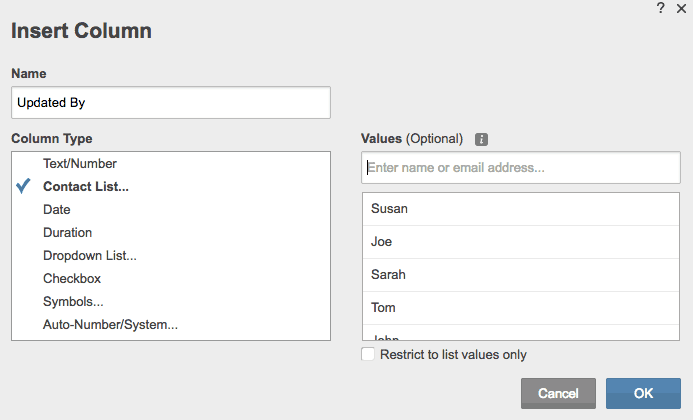 Select the range of data (all the names) you want to include in your list. Make this list into a table by clicking the Insert tab > Table. The dialogue box will show the range of data you selected for the table. Click My table has headers, since we began the list with Employees. Click OK.
Now we have to name this list so that Sheet 1 can pull from it. Click Formulas tab > Define Name on the ribbon. In the dialogue box, type the name of the list. We’ll call it Employees. Double check that the selected range is still correct. Click OK.
Go back to Sheet 1. Now, we have to make the Updated By column into a dropdown list. We’ll use the data validation function to do this. Select the Updated By column to apply data validation to this range of cells. In the dialogue box, choose List from the dropdown menu to restrict data entered in this range to a list. Type =Employees in the Source field, since we’re pulling from the list we just created (in Sheet 2). Click OK. There is now a dropdown list in the Updated By column. Your sheet will only accept data in this column that comes from the Employees list on Sheet 2. You can now fill in the column by selecting a name from the dropdown list. As you accumulate conditional formatting rules, watch out for rule hierarchy. Since you can apply multiple conditions to a cell (or row), they occasionally conflict. When this happens, Excel has default precedence rules that may cause one rule to override another, so you can lose your formatting. To combat this, you can change the hierarchy of the rules. Newer rules will always assume precedence over older rules. This means that the precedence of your rules will be in the reverse order of how you created them. When multiple rules evaluate as true to a cell, they may or may not conflict. Applying multiple rules to a cell does not necessarily mean that they will interfere. Rules don’t conflict if they are changing different things about the cell. For instance, if one rule changes text color and another changes fill color both rules should co-exist in the cell. Rules conflict when the outcomes are the same. For instance, if one rule changes a font color to green and another changes the font color to blue the newer rule takes precedence. All rule hierarchy is controlled through the Rule Manager in Excel. From the Home tab, click Conditional Formatting > Manage Rules… to open the Rule Manager. Select This Sheet from the top dropdown list to pull up all lists applied to the current sheet. To change the order (hierarchy) of rules, select a rule and click the up and down arrows in the top right corner to move it. Click OK. Remember the rule closest to the top will take precedence. Adding a new rule in Smartsheet is easy (you already learned how in the “Basic” section). Now, we’ll apply the same “stop if true” logic from Excel in Smartsheet. Add a new rule by clicking the conditional formatting icon on the toolbar. Click Add New Rule and click Set condition. For this rule, we want to call attention to the shipment order dates that are after 07/01/15. The easiest way to do this is to apply the same logic as “stop if true” in Excel. Click Shipment Order Date in the left field to set a condition in this column. 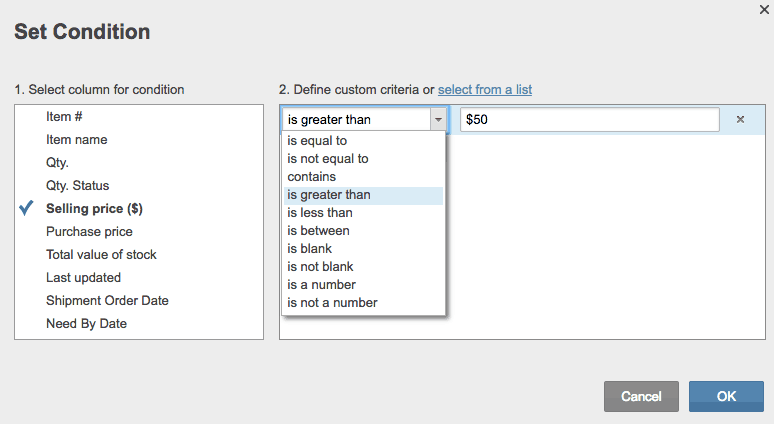 Instead of defining criteria (as we have been doing), click select from a list. The list of values in the Shipment Order Date column appear. Click 07/01/15. Then, because we want to highlight all the dates that are not this date, check the Apply format when this condition is NOT met box. (This functions just like the “stop if true” box in Excel.) Click OK.
Click this format and apply whatever format you want. We’ll make the text bold. Click entire row and select the Shipment Order Date column. Click OK.
Now, all dates other than 07/01/15 will be bolded in the Shipment Order Date column. Just like in Excel, you can use Smartsheet’s built-in formulas when creating conditional formatting rules. However, Smartsheet makes it easy to perform some of the simple functions that basic Excel formulas provide, so you don’t have to worry about remembering complicated formula syntax. To perform the AND function, you can simply click to add multiple conditions to any conditional formatting rule. Click the conditional formatting icon on the toolbar and click Add New Rule. Click set condition. We want to highlight cells in the Item # list that contain both a ‘B’ and an ‘L.’ Click Item # from the dropdown list on the left. For the conditions, select contains and type B. Click into the second prompted condition and type L to create the second condition. (This will perform the AND function.) Click OK. Apply the formatting to your rule. We’ll use a yellow fill. Change entire row to Item #. Click OK. Your sheet will now highlight those values in Item # that contain both a B and an L.
You can still use formulas with conditional formatting, if you’d like. For an introduction on how to use formulas, check out this resource. 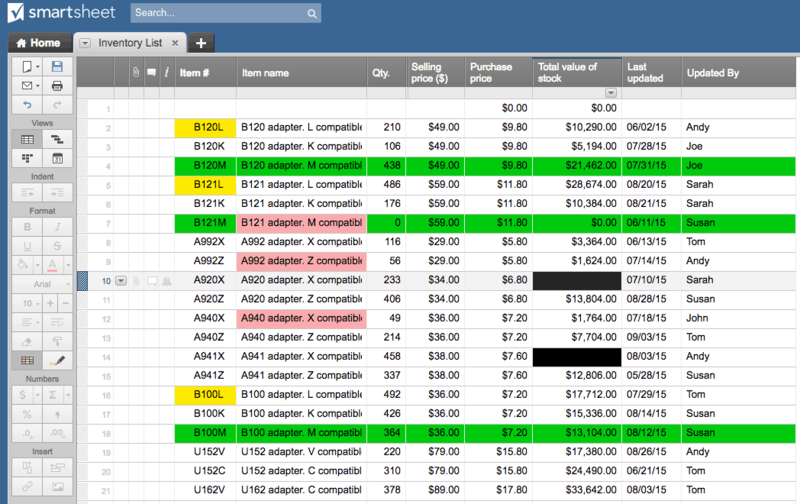 Smartsheet also makes it easy to apply conditional formatting based on another cell. Instead of using complicated formulas to reference different cells, you can simply control which cells to pull from and format with a few clicks. In this example, we want to highlight the Item Name column if the status bar is red, to call attention to at-risk items. To do this, we’ll create a rule that pulls from the Qty. Status column, but applies formatting to the Item Name column. Click the conditional formatting icon on the toolbar and click Add New Rule > set condition. Click Qty. Status from the drop down list and click Red. Click OK. Apply a light red paint fill to format with. Click entire row and select Item name. This will apply formatting to cells in the Item name column, even though we’re pulling information from the Qty. Status column. Click your new rule and drag it to the top of your rules list. Since we have multiple highlighting rules, this will ensure that this rule takes precedence over others (we’ll explain this more below). Cells in Item Name will now be highlighted if the Qty. Status ball is red. Tip: To eliminate visual redundancy, you can hide the Qty. Status column in your sheet. Simply right-click the column and click Hide column. Your sheet will retain its formatting based on that column, but it will look cleaner. In Smartsheet, you can build in data validation by creating a new column with a dropdown list. We’ll create an Updated By column, just like in the Excel example. Right-click on the Last Updated column and click Insert Column Right. Type Updated By in the name field. In the text field, enter the names of the employees. (You can also load contact email addresses into Smartsheet, so team members get a notification when they are assigned something.) Click OK.
You have now created a dropdown list in Smartsheet. The Updated By column will now only accept the values from your contact list. Fill in the names using the dropdown list. Click on the conditional formatting icon to bring up the rules. In Smartsheet, rules higher on this list have precedence. So, the rules have descending hierarchy from the top to bottom of the list. To change hierarchy, simply click on a rule and drag it up or down. After reading this article, you should have a good idea of what you can do with conditional formatting in Excel and in Smartsheet, and how you might apply it to your situation. There are a few topics we couldn’t cover in the steps outlined above. Here are some of the most common questions people have about conditional formatting. Q: Will conditional formatting change the values in my cells? No. Conditional formatting only applies formatting to your cells, based on the values (text, numbers, dates, etc.) in those cells. However, you can use conditional formatting to manipulate the values in your spreadsheet cells by using formulas, or by creating rules that change the value of a cell based on another cell. Q: Can anyone change and/or apply conditional formatting to the spreadsheets? Excel is a static desktop program, so only one person will update a sheet at any given time. Therefore, that single user can update conditional formatting rules. In Smartsheet, the sheet creator, or any collaborator with Admin permissions can create, edit, and update conditional formatting. Editors and viewers cannot. To adjust sharing and editing permissions in Smartsheet, click Sharing at the bottom of the sheet and follow the prompts to invite collaborators. Q: Does the Office 365 (cloud) version of Excel support conditional formatting? Users can view conditional formatting in the cloud version of Excel, but not add or edit any rules. Instead, the user will always have to download the Office 365 file and apply conditional formatting rules in the desktop version. Be careful for version control issues when working with Office 365. Q: I’m not comfortable using Excel formulas. Where can I learn more? Here is a list of common questions for using Excel formulas with conditional formatting, For a comprehensive list of all Excel formulas, click here. For help with using formulas with conditional formatting in Smartsheet, check out these tips and the complete list of Smartsheet functions. Q: How do I add conditional formatting to a new document in Excel? To copy conditional formatting to a new workbook or sheet, select the cells you want to copy conditional formatting from, and click the Format Paint icon (on the Home tab). To paste this conditional formatting, drag your cursor over the column, rows, or entire document you want to apply the rules to. Here’s a walkthrough of this function. Used effectively, conditional formatting can help automate work by acting as a visual alert system. However, for this alert system to be impactful, you’ll need a program that updates in real time, across devices, so that all stakeholders are kept up to date. One such tool is Smartsheet, a work management and automation platform that enables enterprises and teams to work better. As a cloud-based tool, Smartsheet combines the familiar interface of a spreadsheet with robust, real-time collaboration features. Hold yourself and your team accountable, improve visibility into tasks and priorities, and ensure nothing slips through the cracks. Use a pre-built template, to get started quickly, and customize it to include dynamic column types like contact lists, symbols, dates, or checkboxes. Choose how you want to manage your work with one of four views including Grid, Gantt, Calendar, and Card Views. Share your work with internal and external collaborators so that everyone has access and can collaborate in real time. Reduce manual work and stay on top of the details with automated reminders and notifications, and keep key information in context by adding comments and attachments directly to relevant tasks and project plans. Smartsheet integrates with the most popular business systems and cloud applications (including Excel) to enable secure collaboration and data sharing across enterprise business processes. Discover a more collaborative alternative to Excel with Smartsheet. Want to see how Smartsheet stands up against Excel and other Microsoft tools? Check out our side-by-side comparison here.